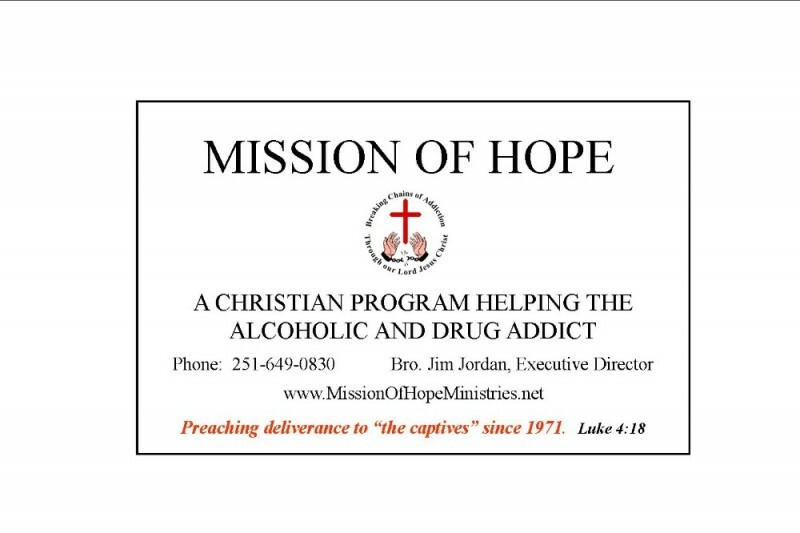 Mission of Hope for Men and Haven of Hope for Women are located near Mobile, Alabama, is a three month, in care, Christian program designed to minister to the men and women who are addicted to drugs or alcohol. The program for men is called Mission of Hope, and the program for women is called Haven of Hope. We have three locations for ladies: Haven of Hope Moffett Rd, Haven of Hope Taylor House, and Haven of Hope Fruitdale. The Moffett Rd and Taylor House locations are in Mobile County, Alabama, and Haven of Hope Fruitdale is in Fruitdale, AL. Mission of Hope Ministries does not charge for their services and is totally funded by donations from churches, individuals, and businesses who have a heart for helping those who are suffering from addictions. We do not recieve any assistance from federal, state, or local governments. If you would like to know more about Mission of Hope Ministries, give us a call at 251-649-0830 or contact us through the contact page on our web page at www.missionofhopeministries.net . View a printable brochure by visiting our Newsletters & Brochure page. We covet your prayers. Good afternoon everyone, and thank you for all of you who help with our mission. All the contributions go to help the the clients in the ministry getting help with there addiction .